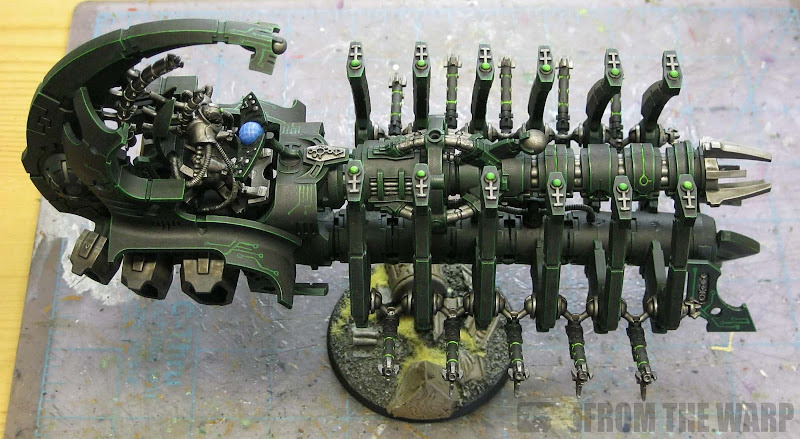 With the new Necron codex and vehicles out now, I decided to try my hand at painting a Necron Ghost Ark/Doomsday Ark conversion to see just how hard it was to get a good tabletop result as quickly as possible. One of the Old Timers I hobby with was kind enough to let me have pick of his Necron units to go through for this little experiment. I decided on the larger vehicle knowing it was going to be more work in the end, but I wanted to push this and see what I could get away with. At first, I thought this was going to take forever by going the line highlighting route. Trying to line highlight this thing would have taken a few decades to do. That and doing multiple passes to get brighter areas would have made it near impossible. Line highlighting is great, but not here. I want to get this thing painted before they get another new codex. As quickly as I thought I could pull it off, I scrapped it. 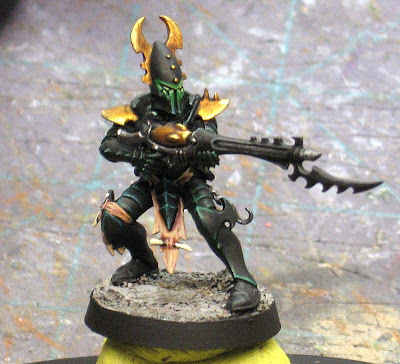 The method I went with was an extension of the method Dave Taylor showed me when I was complaining about painting Dark Eldar models and how hard it might be to get a good tabletop look without spending a ton of time doing it. The big thing with this model was getting a "good" tabletop result and not spending a huge amount of time doing it. All in all, not counting the small pilot conversion or base conversion I did, it took me two days to paint. It was already assembled, I'm only counting the time it took to physically paint. I made a couple small changes to the model with my friend's permission. First, I "attached" the pilot to the vehicle with a handful of cables instead of having him look like he's just sitting there. I thought it might be cool to have him look like part of the vehicle instead of someone going along for the ride. I made the cables out of greenstuff, picked what looked like good attachment points and connected him to the cockpit in six places. The other change I made was to attach the whole thing to a substantial base. 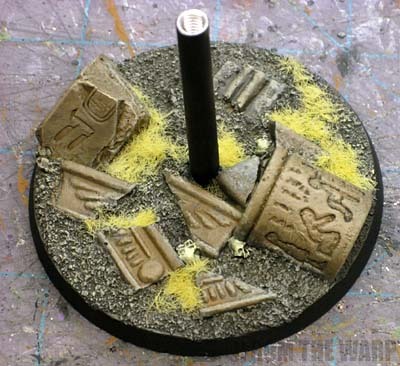 It's one of the bases that I used in my second attempt at a scarab swarm. It's made of plaster so it has some weight. This gave the vehicle some stability once I attached it. It's been attached with a sturdy aluminum, two-part bolt. One portion passes through the base and extends upward to the correct height while the other half is embedded into the underside of the vehicle. All you have to do is thread the two pieces together and it makes a rock solid connection. The end result is a nice, sturdy vehicle with a slightly weighted base to hold it in place. It might be more psychological than anything else, but you don't feel like you're going to break it by trying to pick it up and move it forward six inches now. I should mention the base now since I'll be covering the painting for the rest of the post. 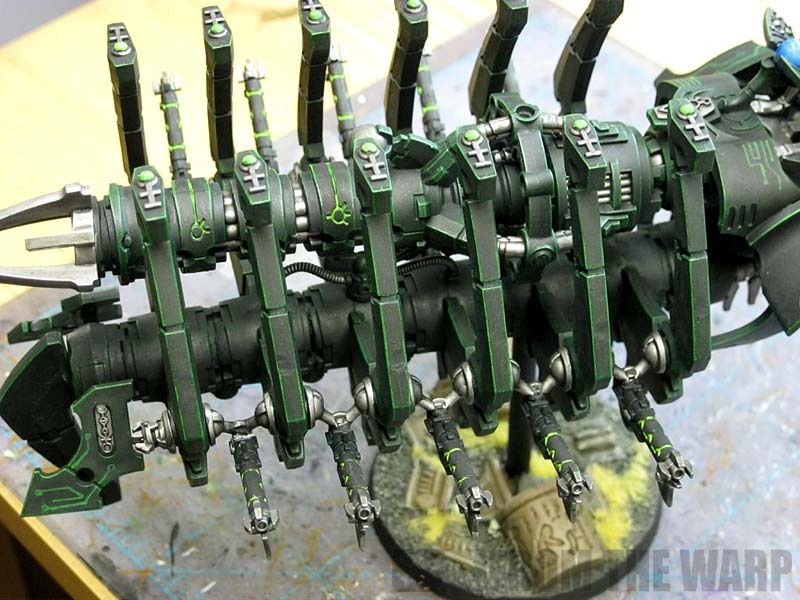 It comes from Khepri's Eternal Legion and is from the same line I used for my Necron scarabs. The base is made from dental stone composite and has a little bit of weight to it compared to a resin base. The composite is super easy to work with (drilling, gluing, etc.) and appears to be quite sturdy and chip resistant as well. My only concern might be for the bottom outer edge of the base where it meets the tabletop surface and paint chipping, but I won't know how it holds up until it sees some games. There's no extra work needed either to prep it for paint or glue. I cleaned up the edge of the base with a X-Acto knife like I do my regular resin bases. Paint took right to it and I didn't have any beading, puddling up or anything like that to worry about. I thought the paint might be absorbed into the plaster quickly, but I had nothing like that happen while working. I have to say I like the added weight when it comes to using it under flying vehicles like this. It adds stability to an otherwise fragile model which is a nice feature. In order to keep this quick (the painting, not the post), there was going to be some sacrifice in quality. This is not a "display" model, but instead a gaming model. There's nothing fancy here and it's just paint. In fact, it's really just some drybrushing and some washes. The first step comes before you paint it. There is one thing you MUST do for this approach to work correctly. You must clean all of your mold lines. You'll need to take a few extra minutes and go over your model with a fine tooth comb and make sure you have them all if you want to get the best results possible going this route. After that, prime and basecoat the whole thing black. Once that dries, it's onto the drybrushing for the highlights. You'll use two colors here, GW Snot Green for the first pass and GW Scorpion Green for the second pass on the prominent edges only. I used a large "tank sized" brush and made sure I focused my efforts on the edges and not the whole or more importantly the flat surfaces of the model. The less paint you get on the flat surfaces here will save you clean up time in a later step. It still goes real quick with a big brush though. With your drybrushing done, it's one good wash over the whole thing with GW Thraka Green. This will mute the highlights slightly and remove some of the lighter stray drybrush marks that are on the flat surfaces. Make sure to let this dry completely before going onto the next step. Since our Thraka Green wash only cleaned up a small percentage of our stray drybrush marks, we need to go back and remove the rest of them on the flat surfaces of the model. This is easy enough to do with slightly thinned black paint. 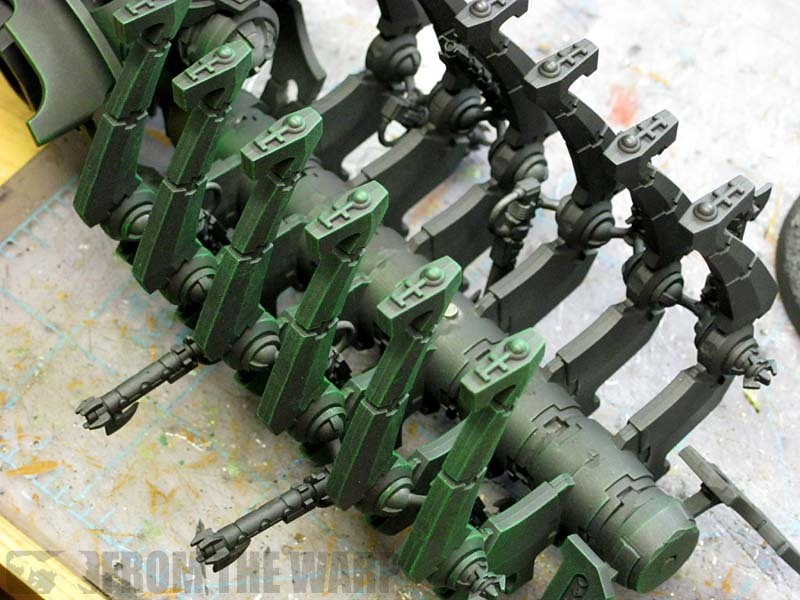 Using it almost like a wash, you paint it loosely onto the flat areas of the model to "clean up" the surfaces. Just make sure to keep the black away from the highlighted edges. If you do get it on there, don't worry, a quick pass with a clean, slightly damp Q-Tip will remove it before any damage is done and you can keep on working. You don't wan't to use the GW Black Wash as it's transparent and to do our clean up work, we want something with a bit more opacity. That's why the paint instead of the actual wash. Thinning it with water only makes it easier to apply and we can get done quicker. That finishes off the majority of the work on the model. From this point on it's details to bring it to life. The metal areas on this are nothing more than GW Boltgun Metal with a Badab Black wash for effect. The "glowing" effect is done with GW Scorpion Green that has been painted into the recessed area, given a quick wash with GW Thraka Green and then the edges cleaned up with black where needed. 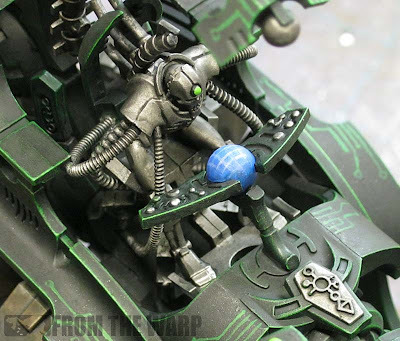 If you decide you want to get into OSL and really pushing the glowing effect, this post will help you. In this case though, I kept it super simple. The last detail is the circuit board like effect on some of the larger armoured panels. It's done with GW Snot Green and simply making a few angled lines with small circles at the ends. You don't need much, just a little bit here and there to add some feel to the model. Since it's really nothing more than black and green, I thought introducing some other colors here and there might liven the model up and bring it to life. Anything to keep it from looking like a huge black/metal block sitting there on the table. To do it, I added some spot colors here and there on the model. The globe that sits in front of the pilot is blue (like GW did on their version) instead of being green again. I added the grid as a detail touch. The engine vents are metallic, but they have soot stains which introduces some brown into them. And the base is the last part of this, it's got warm tones to it so the model sets apart from it. Basing is something you'll have to consider when you start your force, but it's definitely something you want to take into account. Actually, this thing goes on a flying base, but like I said before, I want to add some stability with the heavier base and secure attachment point. Here's the finished model. Two days of painting that went fairly quick. You could probably paint two of these at the same time working on one of them as the other dries and get two done in the same time. I was worried at first how the technique would scale up from an infantry model to a large vehicle, but it worked perfectly. I'd consider this one a win with a fairly nice tabletop quality model done in a short time. It definitely looks much meaner when it's all painted up. As grey plastic, it looked fairly harmless, but it looks dangerous now. 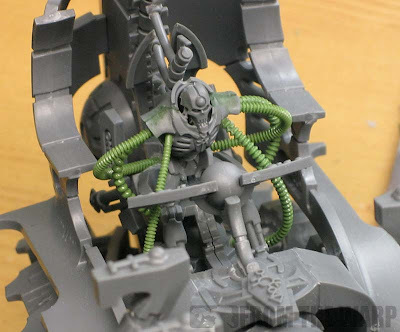 How in the blue blazes did you mould those greenstuff cables? Houghten: Just like Anon said. But don't rush right out and pick one up just yet. I have a full review coming up soon. It's way harder than it looks to get a decent/useable tube out of it. I'm quite frustrated with it right now. Tael: Glad you like it! Can't wait to give this a try, hopefully tonight. Great tutorial! Excellent tutorial. You keep raising the bar for what constitutes "table top" qualuty. 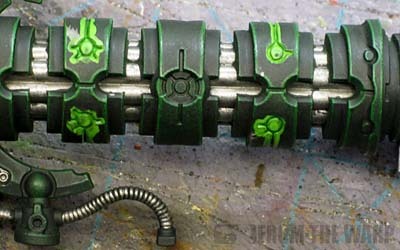 The highlighting technique is not disimilar to something I stumbled upon last week while doing a power sword. Albeit, your approach is a bit more refined than mine. How is it, that your bad quality paint jobs are still better than my highest quality paint jobs?!? Ron, you sir are a hero amongst men! Ant: hope it works well for you! Sendraks: It's only because I've had some practice at it. Taubeast: I don't know about that, the idea was to get a quick and dirty paintjob on this guy so he was ready to go in a minimal amount of time. This really is a "time" technique. FromtheFang: This should be just the ticket then. It's much, much faster than trying to actually line highlight the edges. Even if you used the side of the paintbrush. Vehicle came out awesome looking Ron ! 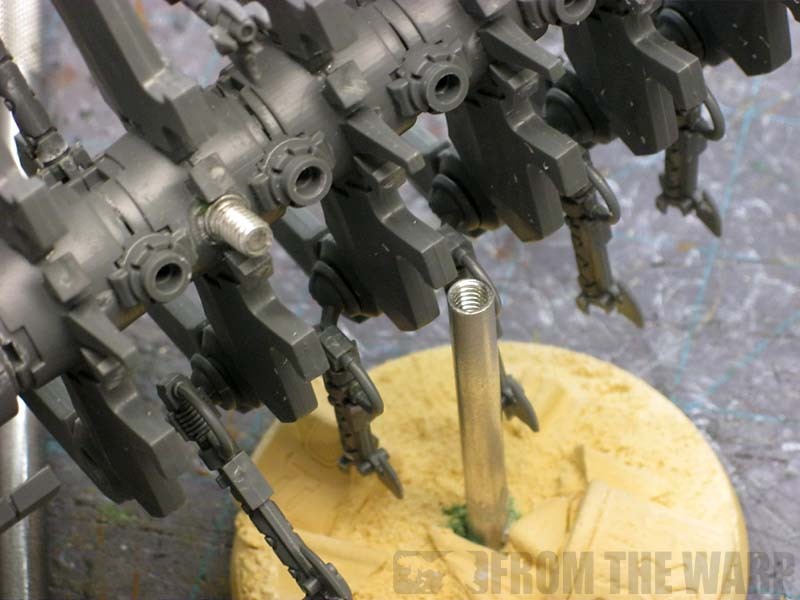 I especially like the two part bolt for the flying base, I normally use magnetized ones, but that looks much sturdier. Going to have to try that on some of my Eldar vehicles for sure. One clarification in regards to the bases, they are made out of a stone composite, not out of a plaster. Not a big difference, but they are much more durable than the plaster and dont dry out and crumble. Thanks for all your hard work and inspiration sir ! Vanduhar: Sorry about that. That's my inexperience with the material and understanding exactly what it is. Change made in the post to better describe the material. Thanks for sharing them with me! I'm about a quarter done with line highlighting a doomsday ark at the moment and what you have there is looking pretty close to what I want it to look like when finished... Maybe just a touch of scorpion green on top. FluffyPanda: Sorry about that. I tried to get it posted as soon as possible, but it took me a little while to get a hold of a vehicle I could use. Since I don't play Necrons myself so I had to "borrow" an Ark. Glad your enjoying our bases, thanks for the postitive feedback! Please let Jeff & I know if you have any comments or suggestions! Ron, you are spot on with your pilot conversion. Having him hardwired into the vehicle is what GW would have done well to do. The command barge/annihilation barge pilots would look great this way too. Remove the legs and arms and wire them in. Matthew: I just figured he looked better being wired into the vehicle. I don't imagine them needing "pilots" like Imperial vehicles do. I don't know about the fluff behind it, but I just went with what seemed cool to me. Well done. I've had one of these sitting on my desk for a few weeks, but I've been afraid to start painting it because of all the lines. I think I'm going to give this a shot. Your work is great as always, nice job! The Harrower: Thanks, now there's no excuse to get it painted up. It goes quick and once you get the hang of it, you'll breeze through the whole thing. It's got an upright section to keep the peaks aligned and is fairly easy to use. Right now it is only shipped inside the US. Really good technique here. Going to need to bookmark this one for the future. Love the idea of switching out the arms for cables. I wasn't at all keen on the idea of Necron pilots tapping away at control panels when I first saw the designs. I was even planning to assemble my barges without the pilot sub-assemblies. It has grown on me a bit though and the new fluff makes it seem reasonable that they'd have pilots. I do very much like the way you've posed the green stuff cables though, great job there. Black Matt: The review should be up next Monday. I need to finish putting it all together. Anon: Thanks, I may have to try them out. Hey Ron, I really like how you've painted your ark. Could you tell me where you bought your 2-part aluminium bolts? 40kNidMan: Absolutely, I picked mine up from Lowes. I'd bet you could get them from any large hardware store that had a good selection of nuts and bolts. If the conversion was set up to allow a Ghost to Doomsday modification, did you magnetize the warrior models? And what other points caused issues on the build? Josh: Sorry about that, I focused on the painting and not much in terms of construction. You comment is spot on though... pull the cannon and rotate the prow. 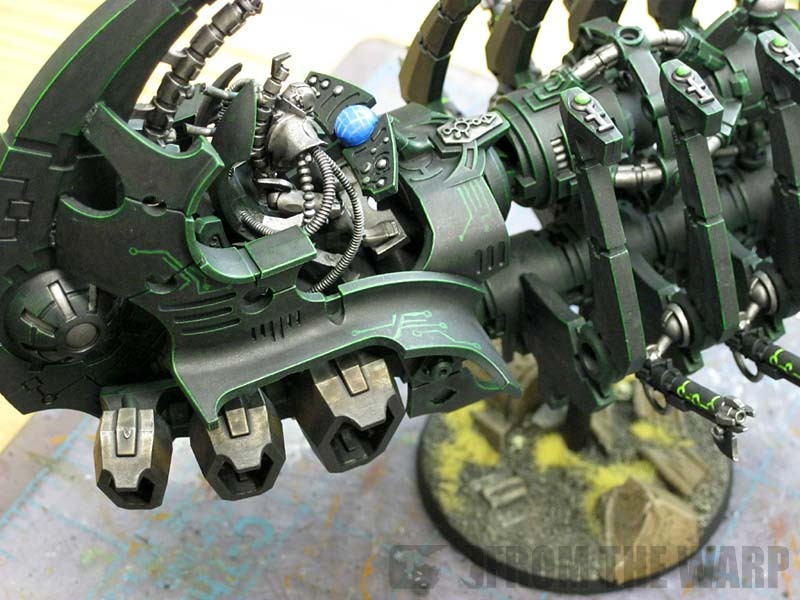 The gun is indeed magnetised into the hull if you will. The prow is also magnetised as well allowing it to be flipped upright or inverted when the gun is in position. As far as the warriors, I don't know about that... I only had the vehicle to paint for a few days and there were no warriors with it. Thanks for this tutorial, I never would have ended up with the finish I did if I hadn't been inspired by your drybrushing approach. I didn't imagine it could possibly work so well before seeing your photos. Best hobby blog on the web by a mile. FluffyPanda: Very nice! Thanks for sharing the link.